I think it would be fair to say not too many Glenavon fans would have heard of their Irish Cup fifth round opponents before Thursday's draw. The Northern Amateur Football League side have been on on incredible journey in this year's competition and now have their own 'fairy-tale' tie against Premiership opposition in the shape of the Lurgan Blues. Rosemount Rec's Ryan Stewart and Scott Ritchie pictured with Glenavon's Rhys Marshall. Picture By: Arthur Allison. Club officials let an almighty roar out of them after they were paired with Gary Hamilton's side for the fifth round tie on Saturday 5th January. Club Captain Ryan Stewart says they can't wait for the game. "When you get to this stage of the competition you want a big club, and we've got that," he said. "It will be great to go and challenge ourselves against one of the top clubs in the country. "We'll all be looking for a fairy-tale and the romance of the cup when we go there. "There's no pressure on us, our boys can go there and enjoy it. "I know nerves will set in, but we have to go there and enjoy the occasion. "We have to take it all in, it's something for us to sample. "A lot of our boys are a bit more experienced and a bit longer in the tooth so there might not be too many more days like this left. "We'll go and enjoy the day and the occasion, and we'll see how we go." 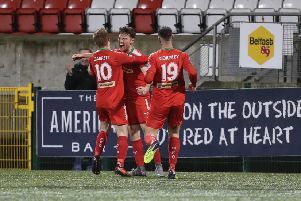 Rosemount have turned into the giant killers already this season beating the likes of Annagh United, Islandmagee and Newtowne already, so Glenavon need to beware. 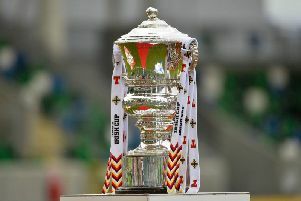 "Last year was our first year in the Irish Cup, but this year we've been punching well above our weight," said Stewart. "We've knocked out the likes of Annagh United and Islandmagee, all teams well above us. "And we have deserved to beat them to be honest. "So to come from nothing to get this opportunity is massive for the community and the village."